"I got my hands on an adjustable-height desk a few weeks ago, and I can't stop raving about it. The model I tried was made by GeekDesk®..."
"Quality certainly wasn't suffering with the price. Though intended for one person, Forbes had three interns happily working at the GeekDesk® Max, with room to spare - though there was some squabbling over whose got to choose which of the programmable set-heights the desk would stay at." 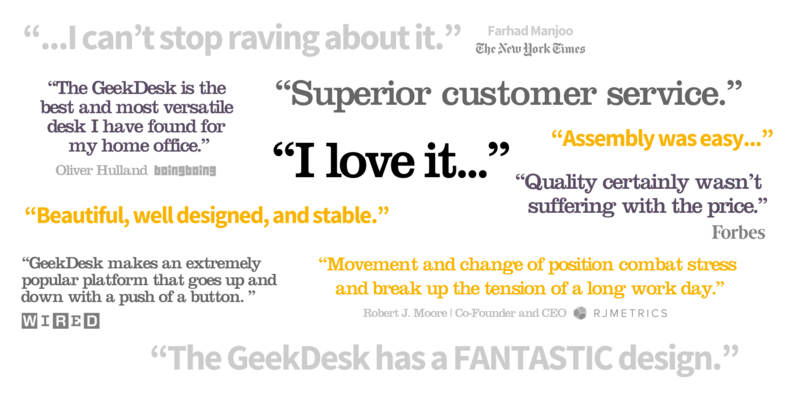 "GeekDesk® makes an extremely popular platform that goes up and down with a push of a button." "All our team members have the option to work on a GeekDesk®, a workstation that has the ability to change height for sitting or standing workers. Movement and change of position combat stress and break up the tension of a long work day." "The GeekDesk is the best and most versatile desk I have found for my home office." "The GeekDesk® truly transforms the way you work. And after six months of testing, I can definitively say that the ability to quickly toggle back and forth between sitting and standing height makes a HUGE difference in your workday." "I love my GeekDesk®. I am able to work standing up or sitting down and for what you get with the price, you're getting an excellent quality desk that I'm confident will last me for years to come... Once you get a GeekDesk, you won't go back to stationary desks!" "It's pretty simple: The GeekDesk® made my life more enjoyable. Thank you for offering a great product at a reasonable price." "Never knew how much it would increase my productivity, you guys rock." "I am thoroughly happy with my GeekDesk®. I bought it in an effort to improve my circulation, since sitting down all day was not entirely comfortable. After I got it (assembly was easy, and everything is well-made and cool-looking, too) I realized other benefits. I was more focused while working, and seemed to have improved energy through the day. I am also a musician, and I found that having my desk at standing height while recording is awesome! Thanks for making a great product, and for having superior customer service." "I have Multiple Sclerosis and use a wheelchair to get around out in the world. I can stand, but not walk. So this desk is absolutely wonderful for me: I probably raise and lower the desk 5-6 times a day. The fact that you've made this so easy to do has given me this body-saving option. I am very, very happy with the desk and thank you for your ingenuity and careful craftsmanship." "I have been looking for this type of desk for my home office (graphic designer) but could not find something affordable that was large enough too. This frame is the perfect solution." "I struggled with back pain before I got my GeekDesk®. Since I bought my GeekDesk® and stopped sitting for most of the day, I rarely experience back pain. Thank you!" "I considered the GeekDesk® for a long time before buying it. I looked at a lot of alternatives, but nothing compared. The desktop is huge, and it gives me enough space to use my docking station/monitor and still have half of it for a workspace - even for meetings. I love it and recommend it to anyone." "The "Geek Desk" was the only desk I could find that would go high enough for this bike-desk application. I had a previous version of this system, (which I had used for 4 years before wearing out the bike) but my workstation had to be propped up on bricks in order to achieve the critical height. This version is much better, and the quality of the desk is outstanding. The GeekDesk® has a fantastic design." "I just built the desk, it looks amazing! I love how smooth the motor is." "I was on the verge of spending $1800 before I discovered you guys. Thanks."